Information and links for a variety of topics related to the concrete repair industry. The American Concrete Institute has made available on their web site several free bulletins on Repair Application Procedures. These downloadable PDF’s give you valuable how-to-do-it information on procedures used for nine commonly used concrete repairs. Produced by ACI Committee E 706, Repair Application. Each bulletin gives a concise description of the repair method. ICRI maintains an online bookstore on their web site. This bookstore has over 100 publications, catalogs and videos available for online purchase. All items are offered to ICRI members at significant discounts. 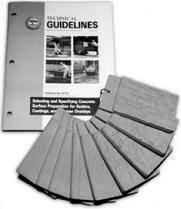 Check out ICRI’s Technical Guidlines for selecting and Specifying Concrete Surface Preparation for Sealers, Coatings and Polymer Overlays. Current and historical weather information for all 50 states. Type in your city and state of interest under “Search” at top of home page. Select your desired Month, Date and Year. New page reflects all available information.